OK. It’s autumn. The time has come to break out the pasta machine, because the new harvest of squash is in the stores and farmers markets. 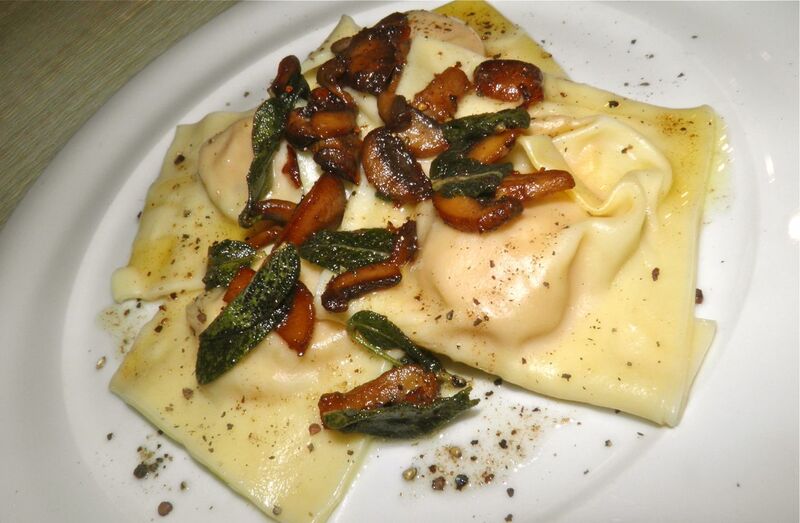 Nothing beats squash ravioli with sage in my books. It is the most wonderful combination of flavours. The pasta has bite, the squash is sweet and the sage imparts a taste and aroma that just can’t be beat. Every Italian restaurant worth its salt will have either squash or pumpkin ravioli on the menu in the fall. Most good restaurants vary their menus by the season to offer diners the best and freshest ingredients. Come autumn, that means squash. I had my first squash ravioli at Il Mercato on Spring Garden Road several years ago. They were fantastic. From that point on they were on my radar to make at home and I have done so several times since. kneading. That 30 minute wait does miraculous things. Here's an interesting tidbit for people who dislike "wet" squash as much as I do. I think I have found out the secret to picking a dry squash out of the pile at the market. I love dry squash. Mushy squash is, well, gross. Dry squash is fluffy, light and soaks up butter like it was born to it. The secret is kind of obvious. You lift the squash and compare how heavy ones of similar size feel. I was doing this at the store to get the biggest one for the least amount of money. They sell squash by the pound (most times). I was being cheap. I have tried other techniques: pressing my fingernail into the skin to see if it dents easily, tapping for a hollow sound, etc. But my new technique makes so much sense. A lighter squash will have less water content. less water content means drier flesh. Duh… It's worked twice so far, but "third time's the charm," so they say. I guess my theory will either pass or fail next time I buy a squash. Don't be daunted by making your own pasta. Making it at home is really quite easy. Ravioli is a little more time intensive but the work is worth it. All you really need is a hand crank pasta roller. In Halifax the only place I was able to find one was at Stokes in Dartmouth Crossing. They’re about $29.98. Go and get one now. You should have one. Tell them I sent you. They don’t know me, but I will get some bizarre pleasure thinking about what they will think when people start showing up to purchase rollers and all say “Docaitta sent me.” Puzzled looks all around, I bet. 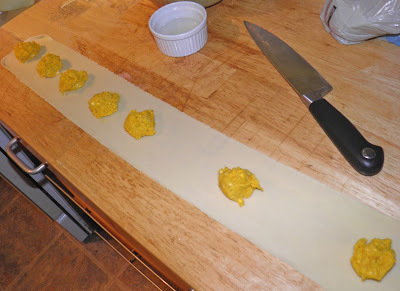 Another important tip about ravioli is that you have to make sure they are well sealed on all four sides. If not you will have a terrible, disappointing mess when they cook. I usually pinch them together again just before cooking. One last note. If you’ve never had fried sage you have no idea what you have been missing. A simple fried sage butter sauce is the perfect complement to these fall ravioli or even plain pasta. Two ingredients, and superb. I added mushrooms to the sage/butter sauce to make it a little more filling, but that is all. Do yourself a culinar favour and make homemade ravioli soon. If you don't eat them all they can be frozen very easily. Space the filling evenly along the strip of pasta. just to ensure the filling doesn't leak out. Mix together the egg and milk in a small dish. Combine the flour and salt in a bowl. Whisk the egg mixture into the flour with a fork. Continue to mix with your hands until a ball is formed. If necessary add a slight bit more milk but err on the dry, rather than wet, side. Place the dough on a board and knead for about 5-8 minutes until relatively smooth and elastic. Wrap in plastic wrap and let rest on the counter for 30 minutes. You can also let it rest longer in the refrigerator. While the dough is resting, make the filling. Mix together the squash, goat cheese egg, salt and pepper. It should be fairly dry and a spoonful will keep its shape. If not, add the parmesan. Set aside. After the dough has rested cut into four equal pieces. Roll each piece out to a thin sheet. (On my pasta machine I have seven settings. I roll to one from the thinnest – 6.) 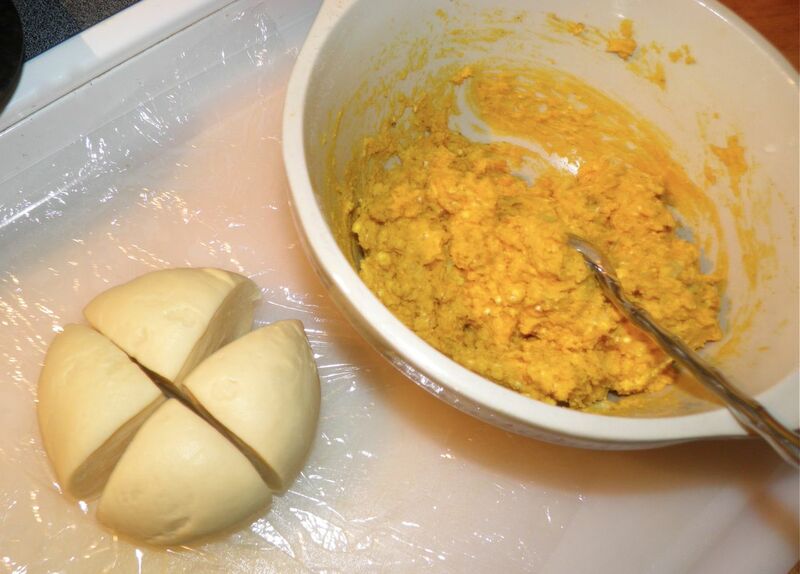 Roll all four pieces of dough. Lay one sheet on the counter. It should be about 2-1/2 feet long. Place a rounded dessert spoonful of filling at each end of the dough about 1/2” from the edge. Place 10 more spoonfuls along the dough at equal intervals. After the top sheet is well adhered to the bottom trim the outer edges and ends with a sharp knife. Then cut down between each ball of filling. This will make 12 ravioli. Repeat with the remaining sheets of pasta. 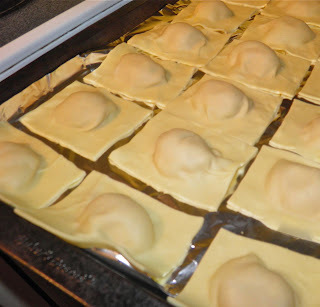 Place the finished ravioli on a lightly dusted surface or a piece of plastic wrap or tin foil. Don’t worry if they’re not perfect. That is part of their charm. Make the sauce by melting the butter in a frying pan. Coarsely chop the sage leaves. Chop the mushrooms and add to the butter. Once the mushrooms start to soften add the sage leaves and let cook until the mushrooms have browned and the sage has darkened. Do not let the sage burn. Season with pepper. Brin water and salt to a boil in a large pot. Add the ravioli and let cook for 4 minutes. Drain and serve with the mushroom/sage/butter sauce. These ravioli are on the large side. An appetizer serving is usually three or four ravioli; an entrée is six to eight.